I am offering 2 free high quality photo holy cards of St Gemma to whomever would like them. 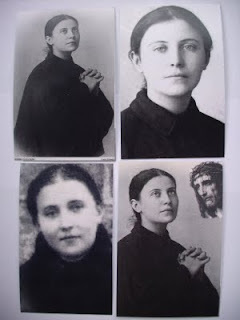 These are large, high quality photo cards taken from original photographs, with a prayer to St Gemma on the back, and are printed on heavy card stock. Each holy card will be touched to a 1st class relic of St Gemma, asking her intercession upon all who receive them. Those outside the U.S.A should mail their request but do NOT need to include a postage stamp with their request. I will pay for the postage to mail the holy cards to those outside of the USA. Please be sure to include your mailing address with your request. -A holy card package with 4 different Saint Gemma holy cards and prayer pamphlet. -A holy card and relic card package with a prayer pamphlet and the option of a St Gemma medal. Do you print the cards yourself? They are very professional-looking! Thank you so much for offering free holy cards of this amazing Saint! The holy cards are actually real photographs of Saint Gemma, attached to a heavy card stock backing, with a prayer on the back. I received the photographs from the Passionist Nuns at Saint Gemma's Monastery/Sanctuary in Lucca, and also from the Postulator General of the Passionists in Rome. I am really glad to hear that you like them. Oh my goodness, I cannot contain my excitement. I have known about this awesome website and have been blessed by it. I only want to know more about St. Gemma and learn from her to increase in faith and love of Our Lord. I wish I could read in Italian so I can order some of the books written about her! Here's the best part....for years I have been thinking about forming a ladies' Catholic book club, prayer group, discussion circle (combination of the three) and have seriously been putting the idea down on paper and making a list of invitations to go out. For several days now I have been thinking of what to call the group and/or which Saint we can adopt as our patron and intercessor. It came to me today.....St. Gemma!....we can learn so much from her and we can have the confidence that she will intercede and protect us! Who knows maybe a book about St. Gemma will be the first book we read! Also with this special group....there will be several opportunities to help with your fundraising to keep promoting Gemma. I will be in contact soon to order some of those special prayer cards! Any suggestions on your part will be greatly appreciated. God Bless! It is a pleasure to meet you. It is wonderful to hear of your joy and devotion towards St Gemma. May God bless and guide you in your efforts. I look forward to hearing back from you in the future. Are there still more cards available? My sister is named after St. Gemma and my family is looking to strengthen our worship in this amazing Saint. Is there a limit on how many we can get??? Thank you so much for this wonderful deed. Yes, I have lots of St Gemma holy cards availible. Just follow the directions in the article above and I will be happy to send you a couple for free. I am so excited to receive the cards. By the way, do you know how can I obtain a relic of St. Gemma? I mailed out your St Gemma photo holy prayer cards yesterday, so you should be receiving them very soon. I will send you an email in regards to information concerning the possibility of obtaining a relic. Thank you so much for sharing the story of your cure and the graces of God in you life, especially through the intercession of St Gemma, St Pio and St Rose of Lima. Blessed be God in His Saints! I pray that St Gemma may always be your special friend and advocate with our loving God, and may she obtain many more graces for you, and lead you into the Heart of Jesus! I am going to copy and paste your message into the "answered prayers" section of this website, for the greater glory of God and His servant St Gemma! I read a bit through your wheat4paradise blog...you are doing a nice job! I am glad to hear of your appreciation and devotion to St Gemma and to hear that you are inspired by her holy life. I pray that we may all seek to follow her example of fervent love and devotion to God, and may we be touched with some of the fire with which her heart burned! I will gladly send you out some St Gemma holy cards as soon as I receive your letter/mailing address. May St Gemma help lead you and keep you in the Sacred Heart of Jesus! I've received th cards yesterday. The photos look authentic! I love it! Its nice to hear from you. Thank you for letting me know that you received the St Gemma holy cards safely. They really had to travel a long way to reach you! I am glad to hear that you like them. The holy cards arrived yesterday. They are beautiful. Thank you for this labor of love on behalf of St. Gemma and Our Blessed Lord. God bless! It's nice to hear from you again. Thanks for letting me know that you received the St Gemma holy cards safely. -I am glad to hear that you like them. 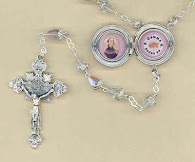 And thanks for spreading devotion to St Gemma on your Wheat4Paradise blog! May you be blessed for that. May St Gemma always be your patroness and special friend! Thanks for offering free Holy cards The quality is really good. She is an amazing Saint. Thank you for your wonderful site about Gemma. My father has just written two articles on her life for an Irish magazine, and I wonder if you have any photos left? It would be a lovely surprise for him to receive one that had been pressed to a relic of Gemma. I also have an aged friend, Laure, who has liver cancer, and it would be nice for her to have a photo too. So, can you please email me your mailing address and I will get them out to you gratis. I just recently discovered your site while trying to learn more about St. Gemma, she is so inspiring! I am going to mail you an envelope with a stamp for a holy card, if I may (I live in Ohio). Thank you for this wonderful gift and for this site dedicated to such an incredible Saint! God bless! I will be happy to send you a few free St Gemma holy prayer cards. Be sure to enclose your mailng address along with your request. May St Gemma inspire you and lead you ever closer to the Sacred Heart of Jesus. I recieved the cards sometime ago and never posted to thank you- they are beautiful! In the one where the Holy Face has been added in the corner, do you know the artist of that drawing? I've been trying to track down a print of that without success. I am glad to hear that you received the holy cards safely and that you are happy with them. The holy card with St Gemma and the Holy Face of Jesus in the corner is one that I made myself, using a computer program to imbed the holy Face of Jesus onto an exsisting photograph of Saint Gemma. I have recently asked St. Gemma to be my special patroness. 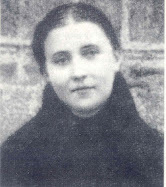 As a single woman who wanted to be a religious and failed, then a member of a secular institute and failed at that too, I, like St. Gemma, professed private vows. Gemma's incredible holiness draws me like a magnet. My greatest desire is to be as totally focused in prayer as she was. Just to be totally lost in Jesus in my aim. I beg her help in this. I never knew that she was invoked by people with back problems. I have been troubled with back problems which have been getting worse with the years. I am going to ask dear St. Gemma for help with this too. Do you think that I am being greedy? I would also be interested in learning how I might procure a relic of St. Gemma. I was also bowled over by the post of the woman who was considering forming a woman's group and naming it for St. Gemma. That same idea has crossed my mind many times and I am still considering it. Thank you for this wonderful site. Thanks for your comments. It is nice to meet you. I am really glad to hear that St Gemma has inspired you. As you read, St Gemma remained a layperson throughout her life, although she ardently longed to become a nun, and tried entering a couple of different religious communities, but it always ended in failure. And so, having always been a layperson, she is certainly an extraordinary model for the laity, as you have rightly discovered, because her life was lived and spent in the world, and she found and loved Jesus amidst the "pots and pans" of her daily household occupations. And, of course you can ask St Gemma to help you with your back problem, as she herself received heavenly assistance for her back problem through the interecession of St Gabriel Possenti, as you certainly must have read on this website. I pray that St Gemma may always be your special friend and heavenly advocate. Thanks for sharing the downloadable St Gemma holy card. May God bless you and your wonderful apostolate. It is nice to meet you. I am glad to hear that your daughter chose St Gemma for her Confirmation project. And I am happy to know that you are both enjoying the website. I pray for both you and your daughter that St Gemma may be your special advocate and friend. I'll send out your holy cards as soon as I receive your request with your mailing info. Is it possible to get St. Gemma holy cards with a custom prayer to St. Gemma? I've ordered the holy cards before, but I have my own personal prayer to her I'd love to see on one of these. If it can be done, I'd very much appreciate it. Yes, it is possible. If you would like, email me and we can discuss it. May Our Lord reward you in every way for your efforts on behalf of one of His most beloved saints. I have loved St. Gemma ever since I heard of her some years ago. So it was with deep joy that I came across your website devoted to her. Even as I write this I feel her presence very near. I am far from a saint, more like a "criminal nothingness" to quote Santa Teresa de Jesus de Los Andes another favourite saint of mine. But these are awe-full times and we must make haste to draw near Our Glorious Lord and His Most Tender and Loving Mother. Are you still offering the St. Gemma holy cards? 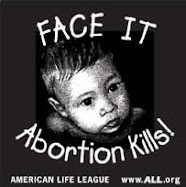 I pray so. 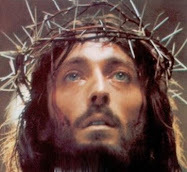 I also pray for you and this apostolate. May you continue to ever grow in the riches of our Most Dear Lord and Lady. Thank you for your kind comments. I am really glad to hear of your devotion to St Gemma. And yes, I still offer the free holy cards. Send me a letter with your mailing address and I will send them out to you. Hello, I know it's really late but are you still offering the St. Gemma praying cards? I have chosen her today as my confirmation saint, and I would love to have a prayer card. I am really glad to hear that you have chosen St Gemma as your Confirmation Saint. She is an extraordinary patron and heavenly friend. Yes, I am still offering the free St Gemma prayer cards. If interested, please postal mail me your request to the mailing address listed in the page above. My wife and I thank you kindly for the St Gemma holy cards you sent us. We completed the St Gemma novena and recite The Holy Hour on Thurs nights. I am really glad to hear that you received the St Gemma holy cards safely and that you are pleased with them, and I am especially glad to hear that you did the novena and also that you have been praying the holy hour together on Thursday evenings. I pray that Gemma may always be very close to you, and may she lead you closer to Jesus, her beloved spouse. I am sorry but I do not offer relics of St Gemma. You can write a letter to the Passionist Nuns at the Monastery of Santa Gemma in Lucca and request one. 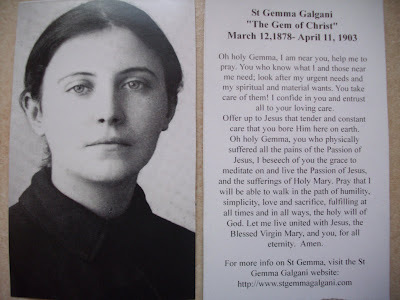 I just found this page and would like to request a holy St. Gemmaprayer card. May I still do so? I have printing out the mailing address, if I am permitted. Yes, I still offer the 2 free St Gemma holy prayer cards. Just simply mail your request to my home mailing address listed in the article above and I will send them out to you....just be sure to include your mailing address with your request. What a wonderful site for such a beautiful saint!!! I was wondering if you're still offering the free St. Gemma cards, I'd love to aquire a few if possible!! Yes, I still offer the two free St Gemma photo holy prayer cards. You can postal mail your request to the address listed in the article above. Hi Glenn! I just received my Holy Cards in the mail, thank you! Everyone is right, they are very high quality. You are very kind to offer these for free. I was wondering what the 1st class relic is that the cards were touched to. I love your site, that you again. May God bless you. Thanks for your comments. I am glad to hear that you are pleased with the free holy prayer cards. To reply to your question, each of the cards are touched to a 1st class relic of St Gemma that was given to me by a Passionist priest. I wear this particular relic in a locket on a necklace, so I always have it with me. It is a "ex corpore" relic = from the body of the Saint. I hope, I am not yet late to have the holy cards of St. Gemma. Yes, I have plently of the free cards. Simply postal mail me your request to the address listed in the article above and I will be happy to mail you out a couple. hello glenn , i am alex antony from thrissur. i have requested for the 2 holy cards by march end. i have sent it by air mail. did the mail reach there in connecticut?. i am waiting for the cards. last time i sent it i received it by 2 weeks. i want to gift this cards to a nun whose name is gemma itself. Yes, I received your request a week or so ago and mailed a couple of St Gemma holy cards out to you, so you should be receiving them soon. Thanks for the holy cards! They arrived on my baptismal day. It was such a treat. I love the quality of the photo look. God Bless You Glenn. Saint Gemma pray for us. Are these still available? I have been dealing with serious back issues that have kept me from working for the past few months. I would love a prayer card if you still have them. Yes, I am still offering 2 free St Gemma holy prayer cards to those who request them. You can mail your request following the instructions in the article above. Yes, I still offer the 2 free St Gemma photo holy prayer cards but you have to postal mail your request to my home address as stated in the article above. I wanted to thank you for the prayer cards that you sent me and to share my daughter’s miraculous story. I requested the cards for my 13 year old daughter, Marian (named after the Blessed Mother as thanks for having a healthy baby after 3 miscarriages) after she was diagnosed with spinal scoliosis by her pediatrician. The doctor was very concerned about the curvature of her back and explained to her that she made need to wear a back brace for several years. I received the St. Gemma prayer cards in the mail 2 days before her appointment with an orthopedic doctor. I had my daughter read a summary of the life of St. Gemma, we said the prayer together as a family, and she slept with the prayer card under her mattress. When the orthopedic doctor examined her, I noticed that I could not see the curve of her spine the way I could in the pediatrician’s office. He quickly stated that her scoliosis was very slight and that she would only need x-rays every 6 months to confirm that the curve does not get any worse. The x-ray taken that day confirmed that she had only a slight curve of her spine (less than 10 degrees). I know that it cannot be proven that a miracle occurred, because her initial diagnosis was only a visual examination- but I do believe! I now feel called to tell others about St. Gemma. Not necessarily because of the miracle, but because I feel drawn to her as an amazing, holy person who obviously is very close to God. My daughter must feel the same because she took the story of St. Gemma to CCD (religious education) to share with her class- which takes guts for a 13 year old! Thank you again & God bless your work! Thank you so much Tina for sharing this inspiring true story! I sincerely appreciate it. Is the St. Gemma Prayer Card available?Ive Printed the letter That I will mail to you it is in a envelope already.Iam just 10 years old.St. Gemma,St .Padre Pio and St. Josemaria Escriva are my favorite saints. It is very nice to meet you. I am happy to hear of your devotion to St Gemma. To reply to your question, yes, I am still offering the 2 free holy prayer cards, so go ahead and send along your request and I will mail you out the cards when I receive it. And please be sure to include your postal mailing address with your request. For several years I have offered two free St Gemma photo holy prayer cards to anyone who requested them through email or through a request in the comment section on the website etc. because I would like everyone who would like them to receive the free holy cards. However, because postage outside of the USA is very expensive, not to mention the cost of each holy card since these are not massed produced holy cards but are high quality photo holy cards that are actually photo's of Gemma, it is now become necessary to require those interested in the free holy cards to send to me a written request in a letter through the postal mail. This is necessary also because unfortunately there are those who request the holy cards not because they have any devotion or interest in St Gemma, but simply because they are free and upon receiving them they then sell them for a profit. Therefore requiring a request through the postal mail will also keep these "false"requests to a minimum. In closing, those who do mail a letter requesting the holy cards can be assured that I will send them. Please be sure to include your mailing address along with your request, and please note also that I send 2 free cards per request. Glenn, can i email you? Just checking to see if you can still mail a postage paid envelope to receive a holy card for St Gemma? Yes! I am still sending out two St Gemma holy prayer cards for free to those who send a request through postal mail (not email). To reply to your question I personally do not recall having read anything in the biographies of St Gemma concerning this, though it is quite possible. can you help me on how to ask a relic of St. Gemma? Thank you for the Cards, I excited upon recieving them. can i request a prayer card of Saint Gemma and can you help me to request a relic of hers? thank you very much. Hi can I request a relic of St. Gemma.